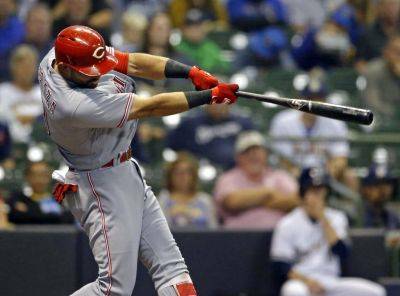 MILWAUKEE — Jose Peraza capitalized on Chase Anderson’s home run troubles with a drive in the first inning and the Cincinnati Reds beat Milwaukee 3-1 Tuesday night, the Brewers’ third loss in four games. The Brewers’ edge for the top NL wild-card spot was cut to two games by St. Louis, with Colorado also in close contention. Milwaukee began the day 2 ½ games behind the NL Central-leading Chicago Cubs. Milwaukee managed only three hits against five Cincinnati pitchers. It was the third low-scoring loss for the Brewers in four games — they fell to Pittsburgh 3-1 on Saturday and 3-2 on Sunday. Scott Schebler opened the first with a single to left off Anderson, who has allowed an NL-high 30 home runs. Peraza then connected for his 13th homer. The Brewers made it 2-1 with an unearned run in the second, but the Reds made it 3-1 in the fourth on Schebler’s RBI double. Michael Lorenzen, making his first start since 2015 after 151 relief appearances, allowed one unearned run on one hit in four innings. Sal Romano (8-11) followed with 2 1/3 scoreless innings for the victory. Raisel Iglesias struck out three in the ninth after a leadoff walk for his 28th save. Anderson (9-8) gave up three runs on six hits with two walks in 3 2/3 innings, matching his shortest start of the season. Six relievers blanked the Reds the rest of the way. In the Milwaukee second, Travis Shaw was hit by a pitch and advanced on a groundout. Shaw came around when Schebler bobbled Jonathan Schoop’s single to right. Reds center fielder Mason Williams made a sensational, over-the-shoulder basket catch on Curtis Granderson’s one-out drive to the warning track in the sixth. It prevented a possible run as Christian Yelich followed with a single. Reds: RHP Homer Bailey probably will not pitch again this season, manager Jim Riggleman said. Bailey (1-14, 6.09 ERA) was removed from the rotation after his last start Sept. 5, and has indicated he can’t relieve. … RHP Tyler Mahle, bothered by right shoulder fatigue, is not ready to start Sunday, Riggleman said. Brewers: Shaw was hit on the left knee by a pitch to open the second and was down for several minutes in the batter’s box. After being examined by the trainer, Shaw remained in the game. He came around to score the Brewers’ first run, but left in the fourth inning with a right knee contusion, the team announced. … CF Loreno Cain left was removed after striking out in the fourth. No reason was given. Reds: RHP Matt Harvey (7-8, 4.67 ERA), whom the Brewers had tried to acquire in August, starts the series finale on Wednesday night. Harvey, obtained in May from the Mets, is 2-1 with a 2.88 ERA in his last seven starts. His 26 starts are his most since 2015. Brewers: LHP Gio Gonzalez (8-11, 4.44 ERA) celebrates his 33rd birthday Wednesday with his third start for Milwaukee since being acquired from Washington on Aug. 31. Gonzalez is 1-0 with the Brewers, allowing three earned runs in 10 1/3 innings after going 7-11 with the Nationals.